One of the great joys of participating in the D.C. area writing community is getting to know so many of the exceptionally talented authors who call the area home. An added bonus is learning some of the backstory behind their work, including what it took to bring to publication. Here are two books from D.C. writers that were just released in October. 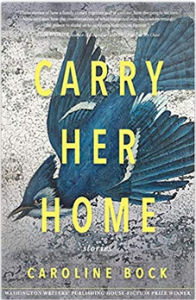 Carry Her Home, Caroline Bock, Washington Writers Publishing House, 2018, 218 pp. This collection of flash fiction and longer stories, many of which are inter-related, is fully, deliciously unexpected. From the first tiny but densely meaningful story, “The Understanding”, and the second, “O, Tomato,” which reads like prose poetry, it doesn’t take long to catch the rhythm of the stories and a sense of direction, and to realize that what remains unstated carries as much weight as what is on the page. The collective effect of the brief flashes of character, location, time frame, and subject is as though someone is flipping through their old photo album to tell you the stories behind a few favorite or crucial pictures. Through shifting voices and viewpoints, we get to know Murray, Louise, and at least a couple of their four children — along with a cast of other characters — and to understand the event that has permanently wrenched apart their family. The core of the stories here are autobiographical, which we only know because the author shares a name with the eldest child; Bock maintains a humane but unsentimental perspective, and displays a wry sense of humor throughout. Her eye for the telling detail allows her to pack entire stories into a few words. Louise’s early adventures when she first meets Murray are some of the most developed stories; if the flash pieces are photographs, these stories are the films. Not all the stories in Carry Her Home are related, and it may take readers a moment to process those — primarily in Part IV and the coda — that are not part of the ongoing narrative. Take that extra moment. 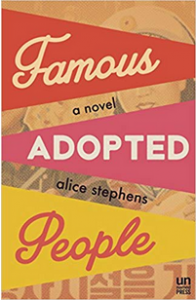 Famous Adopted People, Alice Stephens, The Unnamed Press, 2018, 331 pp. Author Alice Stephens may not be extremely famous yet, but she is adopted, and her debut novel arose from a simple, jarring fact: virtually no story about adoption, fiction or non, is told from the point of view of the adoptee. Famous Adopted People — whose Korean-born, US-adopted protagonist, Lisa Pearl, is self-aware and self-sabotaging, funny, flawed, and frustrating — fills that void with wit, smarts, and attitude to spare. She also explains how she and her friend Mindy — BFFs since eight years old at Korean Kamp, with whom she collects examples of famous adopted people — have adapted differently. While Mindy excelled, Lisa was the poster child for rebellion, a habit that has followed her into adulthood. As the book opens in South Korea, Lisa has run from her teaching job in Japan just ahead of a scandal, and Mindy is kicking Lisa to the curb for getting drunk, doing drugs, and staying out all night right before Mindy is set to meet her birth mother. Cut loose on her own in South Korea with no place to stay and little money, Lisa bumps into her hook-up from the previous night, Harrison, who is also the guy from MotherFinders, the agency that tries to reconnect children with their birth mothers. Lisa has no interest in finding her birth mother, but Harrison is surprisingly insistent. An odd date and a doctored drink later, Lisa finds herself in surreal trouble in one of the most isolated spots on Earth — North Korea. The backstory on bringing Adopted into print is one that should give would-be authors hope: her agent submitted the manuscript to 40 publishers with no takers. As current events involving North Korea, and its young, unpredictable leader, took up more news cycles, Stephens’ book took on a certain urgency. When she — without her agent — submitted it to indie publisher The Unnamed Press, her book was plucked from the slush pile for publication. It’s a fittingly surprising provenance for this out-of-the-ordinary exploration of identity, family, loyalty, and home. Alice Stephens blows up the narrative of angelic adoption stories to give us one that is far from pretty but much more true.